Avian colibacillosis gather different infections caused by an avian pathogenic Escherichia coli (E. Coli). E. coli are part of a healthy and balanced chicken’s gut flora. However, intensive production conditions may lead to a growth of the E. coli population and the development of infections. Poor farm management combined with an unbalanced microflora and/or a low immune system efficiency could increase the probability of these infections. These infections are responsible for significant economic losses in poultry resulting from reduced zootechnical performance, disease and associated treatment costs, condemnations and mortality. In 2013, the economic impact of E. coli peritonitis syndrome was estimated at 3.7 million euros, in the Netherlands poultry farming system (*). Safmannan®, a selected yeast fraction, is known to reduce the negative impacts induced by E. coli in poultry production. E-coli is a Gram negative (Gram -) bacteria. These bacteria have fimbriae, a filamentous protein structure with adhesin at its end. Adhesin are mannose sensitive and can adhere to the mannose-rich epithelial surface of the gut. Thanks to its high content in β-glucan and mannans Safmannan® selected Yeast Fraction can interact with Gram– bacteria. In-vitromethodology (1)emphasized the ability of safmannan to bind Gram- bacteria (E.coli or Salmonella). In this test, the binding between Safmannan® and E.coliwas observed via scanning electron microscopy. Moreover, a meta-analysis (2)of 5 in-vitrostudies that evaluated the binding ability of Safmannan® with different E.coliserotypes could underline that it was especially efficient on ETEC family. E.coliisolates gathered in this family were all coming from poultry. As a result, Safmannan® helps to positively balance gut microflora. A study ran in China (3) on laying hens reared under different densities showed that E. colipopulation in hen’s intestine was significantly decreased with Safmannan® supplementation compare to positive control group with high density. In parallel, villi height and crypt depth were maintained to the level of the negative control (low density). Yeast fraction attenuates intestinal inflammation and barrier dysfunction induced by E.coli challenge. E-coli contamination usually increases intestinal inflammation and permeability, and disrupts gut barrier function. This is mainly due to the activation of TLR4 and TLR4/NF-κB signaling pathway that lead to the secretion of pro-inflammatory cytokines and result in intestinal barrier damage. As a consequence bird’s performances are affected. Wang et al. 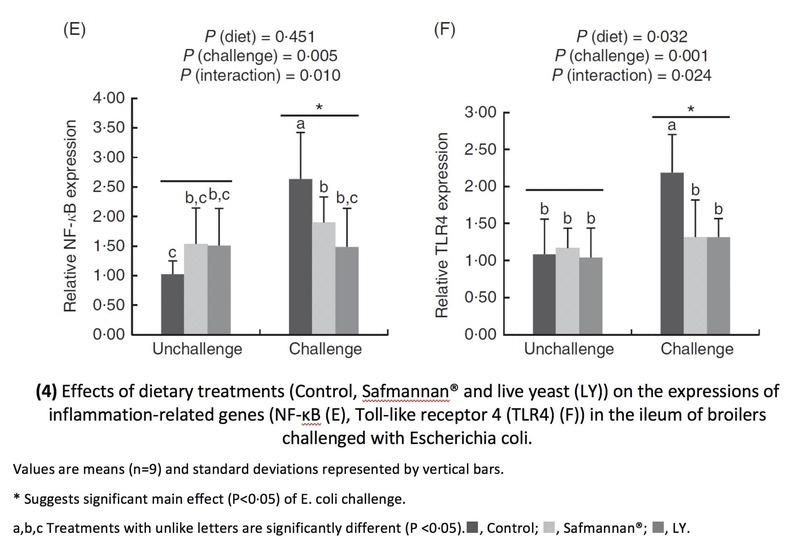 (2016), reported that the selected yeast fraction helps to maintain a good intestinal barrier by reducing the inflammation caused by E.colichallenge. Broilers supplemented with Safmannan® and challenged with E.coliexhibited significantly lower TLR4 and NF-ƘB expressions compared to challenged broilers that were not supplemented (4). They also observed better tight junction’s protein expression when birds were supplemented with Safmannan®. Those results were in accordance with Shao et al. (2013) observation. They underline the ability of β-glucan extracted from Saccharomyces Cerevisiaeto upregulate occludin mRNA expression in the jejunum of SalmonellaTyphimurium challenged birds. When gut barrier is injured, endotoxin coming from the cell-wall of Gram- bacteria may be released into the blood. Other components found in the blood such as diamine oxidase could indicate a gut barrier disruption. 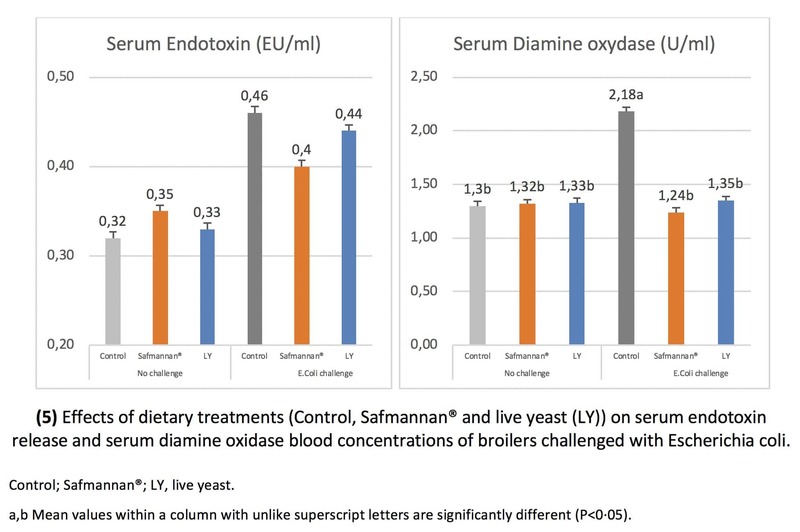 By improving gut integrity, Safmannan® supplementation induced less release in serum of endotoxins and diamine oxidase (5), suggesting a better permeability of the gut in E.colichallenged birds (Wang et al., 2016). By binding Gram- bacteria and reducing intestinal inflammation, the selected yeast fraction supports the protection of the gut when birds are contaminated with E.coli. Recent field data coming from Europe showed benefits of using Safmannan® to decrease E.colipressure in laying hens and breeders farms. Following a peak of E.coli outbreak, these different farms had a dramatic daily mortality rate. Farmers followed a tailor-made program for three weeks to try to control bird’s mortality: Safmannan® supplemented at 2kg/T (6, 7) or 2,5kg/T(8)during 1 week; then 1kg/T during 1 week; then usual dosage at 250g/T. They observed a decrease in mortality rate within 48 hours following the supplementation, without using any treatment such as antibiotics. E.coli contamination induces gut inflammation and, at a certain extent, a gut disruption resulting in performance decrease and high mortality rate in poultry. In vitro and In vivo studies show Safmannan®’s ability to reduce the risk related to the development of E.coli pathologies. The selected yeast fraction binds Gram- bacteria, helps to balance gut microflora and to avoid leaky gut. Its capacity to modulate the immunity helps also to strengthen the bird’s resistance and to face E. Coli pressure.